Eek! CraftingCon continues today - and It's-a-ME, with Mario and Toad (Toadette?)! CraftingCon is a monthly competition with all sorts of gloriously geeky themes, as well as tutorials, guest posts, and more! Make sure you keep watching Mae & K and Friends Stitched Together each month for all the fun! When I saw all the themes for CraftingCon I was hooked on Mario from the start. The games my daughters will likely play will be very different from the games I grew up with, but (so far) the clothes haven't changed (much), and the classic Mario outfits are full of inspiration for fun looks for kids! I used the Tabitha pants by Felicity Patterns - it's an elastic waist pants pattern that can be used with or without the straps, and I love the big pockets! My toddler loves the pockets too, and the straps are just so darn CUTE (even if they do fall off her shoulders!) I love how she wears them pulled up so high! So adorably geeky. Along with the pants I made a simple red tee. I started with Jocole's knit peasant tee pattern for the basic shape, but modified it slightly, cutting it shorter to fit the tshirt I was upcycling - I cut the shirt out of one of mine, so I used the existing hems on the bottom and the sleeves. The sleeves are cut much smaller (because my shirt wasn't big enough for the pattern pieces ;) ), and I used 1/4" elastic with a casing rather than shirring the neckline. For the Toad/Toadette look, I made my littlest a pair of Candy Castle Butterscotch Bloomers and a Little Kiwi's Closet Summer Hi-Lo top. The bloomers are all knit, so they're super comfy, and the hi-lo top is so sweet! Also, I made a Prudent Baby reversible vest (free pattern in 12 mo. size here). The red side has white dots painted on to mimic Toad's mushroom hat. Our playground just happened to have a slide that looks (maybe a little bit?) like the green tubes Mario gets to jump around in, and it's Natalie's favorite! In case you missed any of the previous bloggers' posts and want to see the full range of geeky greatness, just click any of the links below! 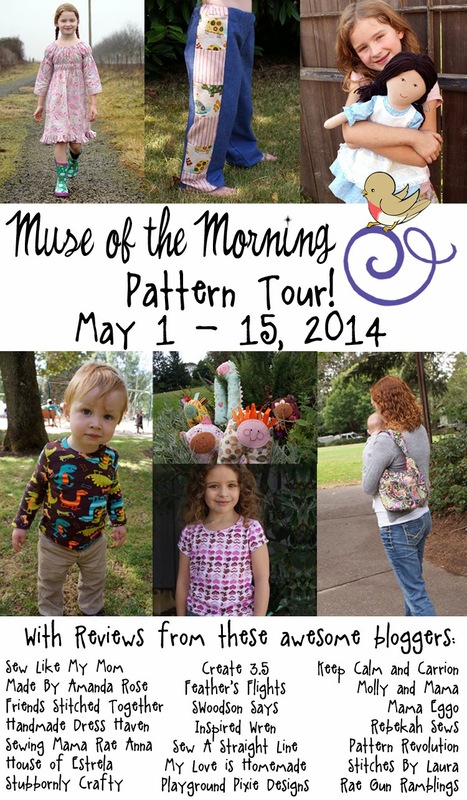 I'm thrilled to be a part of Muse of the Morning's Pattern Tour! Today I have the opportunity to share my interpretation of Muse of the Morning's Ramblin' Raglan with you. The Ramblin' Raglan is a megapack pattern - 7 sleeve styles, 3 bodice styles, 3 lengths, and 2 hem options! With all that, who needs another raglan pattern?? This one encompasses tops, nighties, and dresses; long, 3/4, short, and flutter sleeves (with or without elastic bands or frills); plain bodice for tons of embellishment options or elasticized for a customized perfect fit (with two insertion methods! ); and a straight hem or a pretty ruffle! I chose to make a nightie for Natalie, with a ruffle hem, standard short sleeves gathered with elastic, and enclosed elastic in the bodice. I love the option for enclosing the elastic - my toddler is particularly, well, particular when it comes to the clothing I make her with woven fabrics, and anything I can do to make it more comfortable is a definite selling point! The fabric for the nightgown was Mom-chosen, Toddler-approved. As soon as she saw the sleepy owls, her eyes lit up - and when I showed her the ruffled hem, she exclaimed "Oh, PRETTY!" and demanded to put the nightie on. She also loves the pocket that I added - not especially necessary for pajamas, but the girl LOVES pockets! What toddler doesn't? The pockets hold an ear of corn for snack perfectly! This pattern is so easy to put together. There are only 3 pattern pieces (a front, a back, and whichever sleeve you choose), and measurements for the ruffle pieces. One of my favorite things about the pattern is the fact that the elastic measurements for sleeves, bodices, and the neckline are included in charts with the corresponding step, rather than being listed in a big chart at the beginning of the pattern. 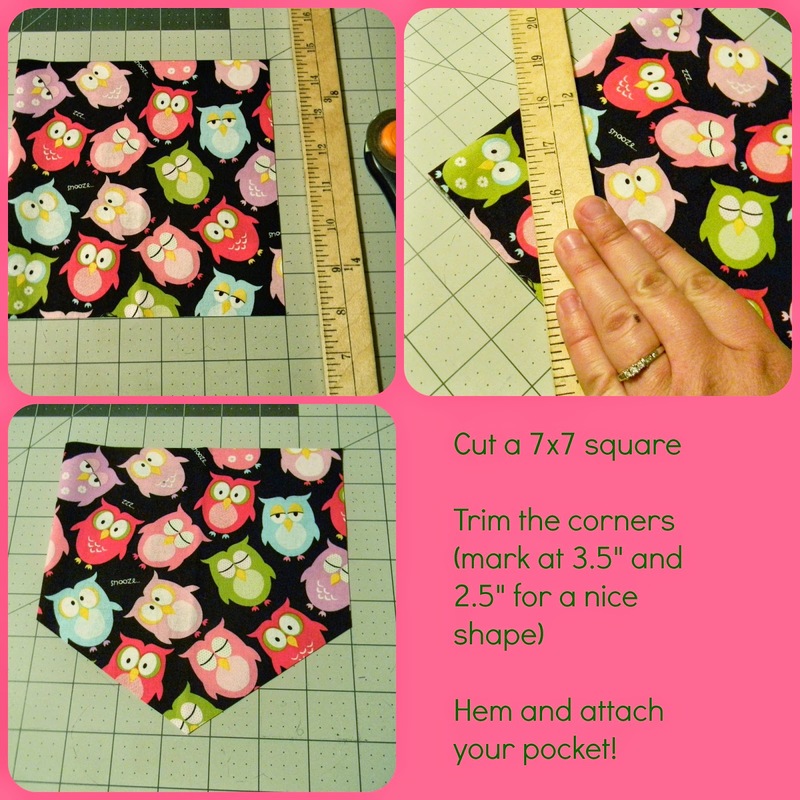 So much easier to cut pieces for a specific step as you go, and no forgetting those measurements! The Ramblin' Raglan is a quick and easy sew. From cutting the fabric to the final stitches on the hem, it took me about 2 hours to put together the nightie (that's estimated actual work time - I'm easily distracted, both by self and kids. There are downsides to having the computer right next to your sewing machine, ha!) The pieces fit together well for a great look - I love the finished piece on its own, and on Natalie. She loves it too - I finished it less than a week ago, and it's already been in the wash twice! She wants to wear it for a day dress as well as a nightie - these pictures are from her "farm girl" shoot. The setting (in the dirt) and styling (yes, that's an ear of corn she was snacking on while posing!) are all her idea. We'll be seeing more of the Ramblin' Raglan around here for sure! And with all the options available, I can make her a whole closet full of different looks before coming close to exhausting the pattern. At only $10.00, this pattern is a fantastic deal, especially for all the different looks you can get with just one purchase! If you buy through the website through May 17, use the code BLOGTOUR30 to get 30% off - that means you can get the Ramblin' Raglan for only $7.00!! Make sure to check out Chrissy's blog and enter the giveaway! 10 people will win a pattern of their choice from Muse of the Morning. Chrissy has patterns for clothing for both boys and girls, bags, ornaments, decorations, and even toys! There are so many awesome bloggers sharing their beautiful interpretations of an array of great patterns from this amazing designer, and you can find all the links on the blog as well! There's really something for everyone. Muse of the Morning's patterns can be found on Etsy, Craftsy, and Muse of the Morning's website. Remember, 30% off your entire purchase until May 17 using code BLOGTOUR30 - on the website only! *I was given this pattern for the purposes of this tour; all thoughts and opinions are my own. If I had to pick one word to describe this pinafore, it'd be POCKETS. I don't know of a single kid who doesn't like pockets, and this pinny definitely has them! They're huge! Well, it is. The pattern actually has one piece that is attached to the front of the pinny, resulting in an oversized pocket not unlike one on a sweatshirt. My three year old looooves pockets. This is a fairly recent development, but since she discovered that most of her clothing has them, she can't leave them alone. Whether it's her hands, her little stuffed dog, or random rocks picked up at the playground, there is always something in them. So far she's pretty good about emptying them, too! I actually tested the 12-18 month size in a dress length for my baby. However, when Natalie saw it, she was overcome with jealousy (astonishing at first, since she rarely likes anything I make her), and I had to make a second one right away. Not at all a hardship - this pattern really is a quick sew! It only took me one evening of sewing to make each one. The pockets can be done in a single layer and edged with bias tape, a double layer and topstitched, or a double layer with piping added. The piping is by far my favorite - this was my first time actually using piping, and is it ever easy! It adds such a fun pop of color, and such a great detail to this beautiful look. Instructions for adding piping are included in the pattern, and Lydia has also posted a free tutorial for making bias binding and piping here. The Beachcomber can be made in a dress length with a contrast band along the bottom, or tunic length simply by leaving the band off. It's a great pattern for summer on its own or with a little pair of bloomers, or fall/winter layered with long sleeves underneath and a pair of leggings or tights! (Note: if you're planning to layer it, going up a size on the bodice is recommended, as woven fabrics don't have a lot of give.) You can also make this in a knit, but make sure it's a nice thick one, and that you have some interfacing for the shoulders so they don't stretch out with the fasteners over time. The pinny snaps or buttons over the shoulders for easy on, easy off. It comes in a wide variety of sizes, from 0-3 months all the way up to 12 years - and it's definitely a pattern that can work with all of those ages! It looks equally cute on babies and on tweens! The Beachcomber Pinny can be purchased on etsy or craftsy for $10 - but wait! 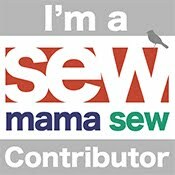 If you buy right now, in honor of the sew-along Lydia is hosting on her blog, you can get it for $2 off! Plus, join the sew-along for a chance to win two more of Lydia's great patterns - read about it here! Tie Dye Diva's Perfect Party Dress to Perfect Picnic Dress! I was told to make the dress my own - change something up. Whether pintucks, pleats, or pockets, add (or subtract) whatever necessary to make this dress one of a kind! I'm one to follow a pattern more or less to the letter, at least until I'm comfortable with it. But after looking over the pattern, I realized something. This is a perfect (yes, it's aptly named) pattern to change up, mix up, make it your own. At its heart, it's a sweet, girly-twirly little dress with puffy sleeves, sure to make any little princess gasp with delight. But it can be so much more, as you've seen through this tour! No sleeves. I tried finishing the armholes with bias tape, but it looked too stiff and weird when I was done, so I ripped it out. I finally just clipped the curves and turned both the front and lining toward each other, and topstitched the armholes closed. A little fiddly and a little time consuming, but I think it looks much better than the tape did! Sash or no sash? Love the option for contrast fabric, why not? How about adding an apron? I didn't really take pictures for a tutorial, but it was very simple. All I did was cut a rectangle 2-3 inches shorter than the width of the front bodice, then the length two thirds of that. (So if your width was 9 inches, your length should be 6.) I serged around the rectangle to prevent fraying, attached trim to three sides, then laid it right sides together with the bodice. I had already pinned the sash in place, so the apron would lay right under the sash piece. Then I sewed the whole thing together, and followed the instructions from the pattern for the rest of the dress! Embellishments? Red lace isn't the first thing I think of for children's wear, but added to an apron and shaped into a sweet little rose? Perfect! I rolled and wrapped the lace around itself, then hand stitched it to the bodice outer before lining it. It took some trial and error to get something resembling a rose, but I'm happy with the final result! Buttons? Snaps? (Do I dare to try for a zipper instead?) I went with snaps, because A) they're fun, B) they're so, so easy and C) they're great for quick changes on little bodies! Faster and less fiddly than buttons, and no worries about them popping off. And voila! From fancy party to relaxing picnic, in just a few easy steps! See how much fun a new dress is on a sunny day in the grass? Life IS a bowl of cherries! I love the lined bodice. It looks so neat and professional, and it's so easy to do! The steps are laid out just so, and the pattern goes together so neatly, that a beginning sewist would have no problem at all. It's the ideal way to pop in that simple but beautiful coordinate - now you see it, now you don't. This pattern offers so much for customization. The plain front bodice is great for embellishing with embroidery or applique, and the big gathered skirt begs for a sash, an apron, or pockets. Instead of gathers, try making pleats! Use shaped buttons, or covered buttons to match (or add a fun contrast) to your dress fabric! This dress comes in two size bundles: 0-24 months or 2-10 years. I made the 12-18 month size for my 12 month old, and it fits like a dream! Hop over to Tie Dye Diva (affiliate link) and pick yours up today. This week you can get either pattern, babies or girls sizes, for $6, rather than their regular price of $7.95, by purchasing through one of the blog hoppers! Click one of the affiliate links in my post, or the button on my sidebar. 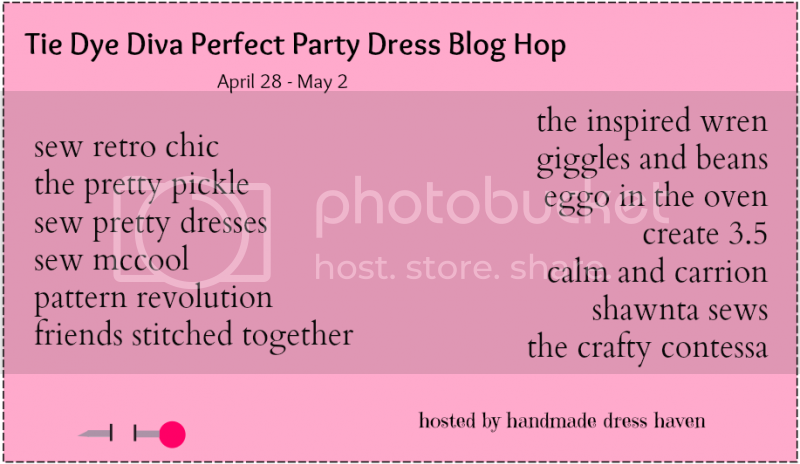 Also, make sure you visit Handmade Dress Haven, who is hosting this amazing blog hop! She wants you to go make a pretty dress for your little girl, right now! *I was given this dress pattern for the blog tour. All thoughts and opinions are my own. **This post contains affiliate links. If you purchase an item following one of these links, which are noted, I receive a small portion of the sale.